Infiniti is a luxury automaker which is manufacturing luxury cars since 1989. This brand is a sub-division of the Japanese automaker, Nissan. The company started selling cars in North America and now it has a global presence. The company is also into making futuristic electric cars. 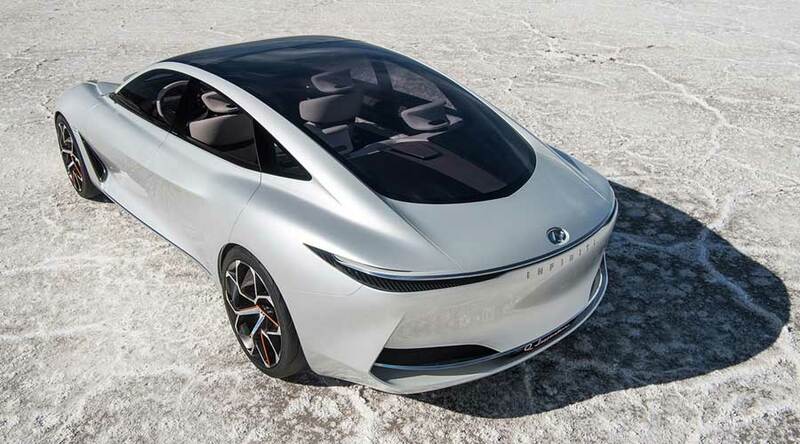 Infiniti recently unveiled the Infiniti Q inspiration concept to the world. 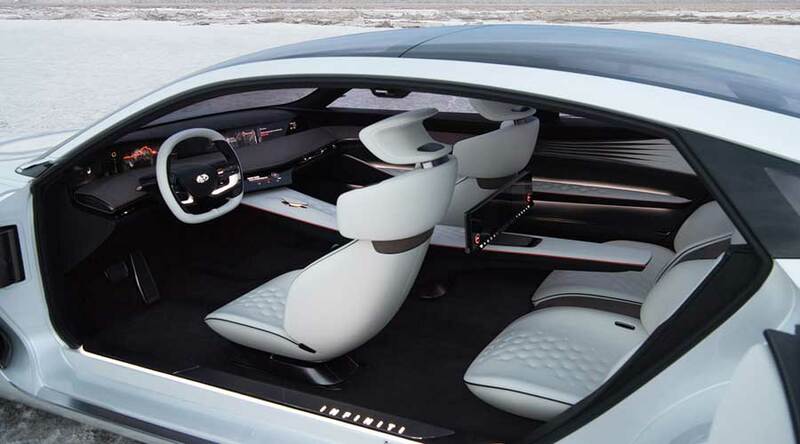 The Q Inspiration concept is just the glimpse of future. The company recently announced that it will be moving away from traditional diesel and petrol cars. However, the company will produce all-electric or hybrid cars from 2021. The Q Inspiration is equipped with next-generation ProPILOT Technology. So, you just delegate the control and take it back to you as and when you want it. Such a correlation between the technology and humanity brings enjoyable driving experience. So, you can simply drive yourself to the countryside while you can enjoy the scenic routes on the way. Alternatively, you can let the car drive itself in hustle and bustle of city traffic. Such an arrangement reduces stresses. It also helps to concentrate on productive time. The exteriors have the stunning design with minute details. Short hood with longer body adds space inside the car, making it more comfortable. The hidden side-exhaust represents purity in design. The all-new 3D textured front grill enhances the front of the car while representing the expressive energy. Infinity also designed the interiors around the driver and co-passengers. While designing interiors, the main focus is on distraction-free driving. The driving distractions are the cause of the most accidents. The Q inspiration addresses these distractions exactly so that the driver can concentrate on road effectively. The steering and dashboard are ergonomically designed. Steering adds more grip and control while the dashboard gives more visual details at one glance. The visual details include car condition, maps and, speed etc. The minimalist interiors add to the beauty. The tailored surfaces with rich textures and precise details give more appeal than ever before. The Infiniti Q inspiration concept gets its power from the first production-ready variable compression engine. The VC-Turbo engine can internally adjust itself. Thus, it can deliver either maximum performance or maximum fuel efficiency. So, it is the combination of two different traits in one engine. 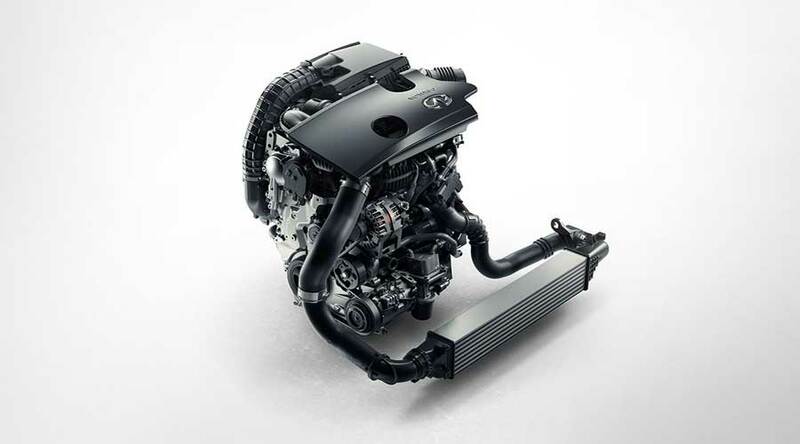 The VC-Turbo technology combines power from the 2.0-liter engine with efficiency and torque of advanced diesel powertrain without the equal emissions. This can only be achieved by mastering the variable compression ratio. Furthermore, the VC-Turbo engine can change the compression ratio. The advanced multi-link system helps to change compression ratio seamlessly as per the driver inputs and driving conditions. The system then automatically selects the best compression ratio. So you can select compression ratio from high performance (8:1) to high efficiency (14:1). The new VC-Turbo engine can be a technological breakthrough with variable compression. It is a significant leap forward in terms of technology, power, and efficiency. In conclusion, Infiniti Q inspiration concept is setting up a benchmark in the auto industry with the revolutionary engine.